Hello and Happy, Happy New Year my Dare 2B Artzy friends! I can’t believe that 2017 is here!! The last 12 months were a blur and if you’re like me you were all too happy to bid farewell to 2016. I know I’m thrilled it’s 2017. However despite all the chaos of 2016, I still found joy in being able to lose myself in my Dare 2B Artzy projects – even for just a few hours. Getting to play with all of the fun Dare 2B Artzy stamps, dies, paper and inks is a great way to escape. So today’s project is a celebration of the New Year and turning over a new leaf in 2017 and it just so happens that it fits into this month’s challenge theme of SOMETHING NEW as I used my new watercolor paint sets that I received for Christmas and I tried out my glitter foiling for the first time. When I was playing around with my stamps trying to come up with an idea for today’s project, I was looking at the Blissful Blooms stamp set and started looking at the fun squiggly lines. I thought that they kind of resembled streamers and confetti, so I decided to make a background from them. To do this, I cut a piece of Strathmore Coldpress Watercolor Paper in 140lb weight to a 6 x 8 inch panel. I placed the panel into my MISTI and stamped the squiggly lines with some Versamark ink. I find that with watercolor paper I usually have to stamp the image 2-4 times to get a good imprint because the paper has so much texture. Once it looked like my image was completely stamped, I sprinkled on some Ranger Embossing Powder in white and heat set it. I repeated these steps several times equally spacing my squiggly lines until the entire panel was almost completely filled up with my white, embossed lines. Using the MISTI to stamp the Versamark Ink to get a clean image each time. With a fully embossed background, I taped all the edges of my paper to a 12 x 12 metal sheet I have using some duck brand painters tape. Taping the edges to the sheet holds everything in place while I’m working and it seals the edges in case the water happens to run, it won’t bleed under the taped areas. You could use any large, flat surface – even a cutting board. Once the image was taped down, I was now ready to break out my new water color set. In the past, I have used the Kuratake Zig Clean Color brush pens to water color. They work great, however I’d been wanting to try real water colors and paint brushes so I ordered myself a Christmas present (because I’ve been good all year & I knew Santa would agree) and picked up the Kuretake Gansai Tambi 24 colors set for a really great price (which makes it even more deserved, LOL!). My mom gave me the Gansai Tambi Starry Colors metallic water color set for Christmas so I was dying to play with them. I will preface this by saying I’m such a novice with anything concerning water color, but I am absolutely in love with these. Once you add water to the pallets, they are like butter and they really work best if you let the water do the work for you. The best part is how vibrant the colors are. I think water color never appealed to me because I love bright bold colors and I didn’t think it was possible to achieve that with water color – turns out I was wrong. I picked out 5 bright colors (Purple #139, Pink #32, Teal #57, Sea Foam Green #50 and a Light Blue #62) and began by adding some water with a fine tipped brush to my paper and then picked up my colors randomly and painted the streamers in alternating colors. I left the wider spaces uncolored because I wanted to use the metallic water colors on those. For the metallic I chose Red Gold #902 and Yellow Gold #903. Again, I applied water to my paper first and then picked up the metallic paint and dabbed the pigment on and let the water pull the color down. When it was dry I was able to go back in and add more color to areas to brighten them or more water to tone them down & smooth out the color. The cool part was watching the metallic pigment react with the water and you can watch the sparkles as they rolled downward on the paper – it was like watching a sparkly lava lamp. Embossed image taped down to be water colored. Once the background was completed, I set it aside to dry. I used the same process to create the leaf, using the Blissful Blooms set and stamping it to some water color paper and then heat embossing with some champagne embossing powder. Next I water colored the leaf using blues and greens (Teal #57, Blue #64, Light Blue #62 and Light Green #51). Once it was dry, I fussy cut the leaf out and set it aside. For my sentiment, I found a fun font online and typed out the Happy New Year and printed to my laser jet printer. Next, I die cut it with the stitched rectangle. I found that with the glitter foiling it was easier to die cut the image before running it through my MINC because the glitter tends to come off in the die cutting process which I learned through trial and error. Close up you can see how the glitter rubs off so easily. To run the image through the MINC machine, I folded a piece of white cardstock in half and placed my die cut sentiment in the center of the folded cardstock and then placed the pink glitter transfer sheet on top of the image glitter side down. I ran the piece through my MINC on a setting of 5 (highest setting) three times. The result was a nice glittered sentiment. Although I really like it, a lot of the glitter still manages to rub off so you do have to be careful about that. There may be some brands that work better than others. Foiling is still the best technique in my book. With everything done, I was ready to assemble my card to a black cardstock base that was 5 ½ x 4 ½. I cut my water colored panel down to approx. 5 ¼ by 4 3/8 and adhered it to my base with some heavy duty adhesive tape. Not great lighting, but you can really see the metallic paints best in this light. The sentiment was popped up with some dimensional foam as was the leaf. I’m so pleased with the way this card turned out. I really think it ended up looking like streamers and confetti in the background. 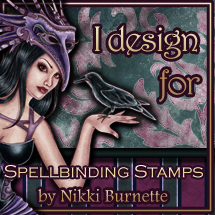 It is so fun to look at your stamps in a new way and create something different and unexpected – especially when you’re trying something new and using a new product or technique. I know I’m not alone in that 2016 was filled with lots of personal challenges for myself in taking on a new management job with the company I work for resulting in lots of long hours, stress and even a few tears, my husband losing his job and being off work for almost 4 months and both of our fathers had difficult health issues that resulted in a move to nursing home care for my step-father in early 2016 and my father-in-law in Dec 2016. My hope for everyone is that 2017 represents a year filled with love, laughter, kindness and turning over a new leaf – whatever that may mean for you. Out with 2016 and all the chaos it created in the world and in with what I hope will be a better, brighter, healthier New Year for everyone! Please join in on the Dare 2B Artzy Something New challenge this month. If you got some awesome new crafty supplies or Dare 2B Artzy stamps for Christmas, we’d love to see what you create with them. You can enter up to 3 times – if you use a Dare 2B Artzy stamp set you get an extra chance at winning. Stay tuned for some fun new stamps that will be coming out within the next month. I know you’ll love the new releases! ← Dare 2B Artzy Holiday Blog Hop! !